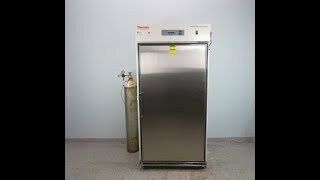 The Thermo Scientific Forma 3950 Reach-In CO2 Incubator is large capacity at 29 cubic feet, making it a first rate choice for high-throughput requirements. The extra space provided by this incubator is well suited to handle large experiments as well as storing valuable samples on a long term basis. The stainless steel interior can easily accommodate shakers, bioreactors and other similar equipment in an environment that’s tightly controlled. Heavy duty stainless steel shelves are corrosion resistant and are seated in durable cabinets that feature true laminar airflow. To fit your lab’s set up and minimize refilling frequently, the Thermo Scientific Forma 3950 Reach-In CO2 Incubator has three water fill options, automatic, semi-automatic and ergonomic manual, and swivel locking casters for easy mobility. The high capacity water reservoir is externally heated for long life. The Thermo Scientific Forma 3950 Reach-In CO2 Incubator also uses two thru-wall access ports to enable the addition of power cords, sensors or probes, and are positioned on either the right or left sidewalls. The Thermo Scientific Forma 3950 Reach-In CO2 Incubator features an intuitive message center, with bright displays for ease of monitoring parameters. Operating parameters such as humidity levels, and displays process and alarm status messages. Humidity is monitored and controlled with a heated glass door, and three reliable, easy to use, customizable UI settings. Controlled by a microprocessor temperature and CO2 levels are constantly displayed. Contact us today to learn more about our Thermo Forma 3950 CO2 Incubator. This Thermo Scientific Forma 3950 Reach-In CO2 Incubatorhas been tested and calibrated per the manufacturer's manual. All of our lab equipment comes backed with our standard warranty. Should you have any questions, please don't hesitate to contact us.